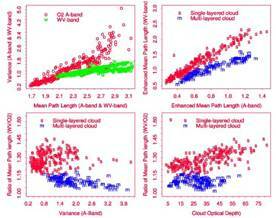 Joint statistics of mean and variance of photon path length with cloud optical depth in O2 and H20 bands. Clouds remain the greatest sources of uncertainty in global climate change research. The impact of greenhouse warming on cloud amount through climate feedback can make significant changes in the global radiative energy balance. Knowledge of cloud properties and their spatial and temporal variation is crucial to advance understanding of global climate change. For a long time the remote sensing community has recognized the advantages of retrieval using the oxygen A-band, and has sought ways to exploit these advantages to measure atmospheric properties and constituents. Because oxygen is a well-mixed gas in the atmosphere, the pressure dependence (as a surrogate of altitude) of oxygen A-band absorption line parameters provides a vehicle for retrieving photon path length distributions from spectrometry of the oxygen A-band. The concept underling oxygen A-band retrievals is the principle of equivalence, which allows assessment of atmospheric radiative properties at any nearby wavelength from a photon path length distribution measurement at one particular band. This is possible because the scattering properties of cloud and aerosol vary slowly and predictably with wavelength and 760 nm is a useful central wavelength, reasonably representative of the entire solar shortwave. Photon path length distributions, a hidden property of standard radiation transfer models and controlled by spatial distributions of scattering and absorption, can be retrieved through an inverse Laplace transform based on the equivalence theorem.